If you’ve made it to this blog, chances are you’ve heard a thing or two about green building, or about its components: energy efficiency, air quality, material sustainability or building durability. But have you heard about an umbrella term that encompasses many of these topics, the interdisciplinary study of building science? As Green Building Manager for green-built alliance member company Deltec Homes, and with an academic background in physics, I consider myself a building scientist above all, and I’ve recently returned from Building Science Summer Camp, an annual conference put on by the Building Science Corporation, bursting with new insights and enthusiasm on the subject. Buildings use a lot of energy, and energy use has concerning environmental and economic impacts. The biggest component of energy use in most residential buildings is heating and cooling. Meanwhile, moisture in buildings can have huge impacts on the durability of building materials and on human health, and is a huge source of litigation in the building world. Moisture and heat are often tied together in today’s buildings, due to physics, and due to mechanical systems which can be a way to remove moisture, or can sometime fail to adequately do so. Additionally, while some problems with buildings would become obvious very quickly: (e.g. if the structure isn’t engineered right, gravity will pull it down; or if the electrical isn’t done right, you might have a fire) the discipline of building science often focuses on more insidious problems that might take time to develop. Things like high energy use due to hidden holes and drafts in a building, or moisture that builds up over time due to defects in flashing. Most of this is not about discovering new physics, we are typically just applying concepts we already know in ways unique to the particular materials and climatic conditions of a given building. But it turns out there are many, many variables to the same old science, especially as new building materials are now proliferating, and have the potential to be used together in a nearly infinite number of ways in a wide variety of environmental conditions. 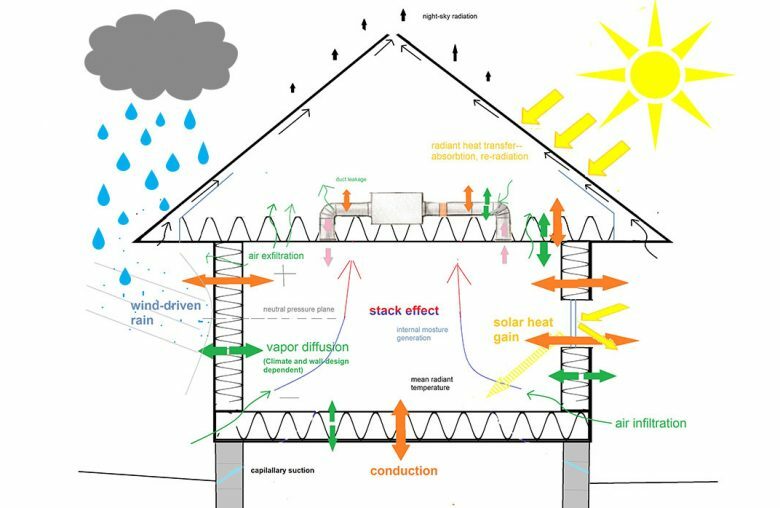 Without an understanding of building science, one might use a building technique meant for one climate that causes problems in a different climate, or pair together materials with vastly different moisture properties and end up with unintended moisture buildup hidden inside a wall or ceiling. Building science is often applied to new construction, but it is critically important for renovating existing buildings as well. Not only must the properties of currently available building materials be understood, but also how they might interact with historic materials. How were buildings built 10, 50, 100, 500+ years ago? What factors contributed to their longevity that should not be altered now? One of the most interesting talks I saw at this year’s Summer Camp was from a PhD Physicist who works for the Historical Society of Britain, advising on what to do with buildings that can be thousands of years old to keep them in good shape. She applies the concepts of physics every day to this real-life challenge. What materials mixed together will cause unintended problems with high energy use, moisture, fungal decay, or other durability issues? There’s lots of new developments in more advanced mechanical systems these days: multi-stage heat pumps, mini-splits, fresh air ventilation systems, all kinds of incremental improvements in efficiency or other factors to existing technology for heating and cooling, water heating, and dehumidification. What problems do newer systems solve—and what new ones might they create? How do these systems work especially within exceptionally well-insulated, air-tight (commonly called “high performance”) homes–like many new homes being built here in Asheville. And of course, building energy use. What saves energy, by how much? In a single house, in a neighborhood, in an entire community or city? Which energy saving measures are cost-effective, and which yield little results? How should state and utility programs whose goals are to drastically reduce energy use, focus their program efforts? Where can I go for more information on building science? Building science is increasingly being taught in community colleges and in colleges and universities, but currently many people in the industry came here from somewhere else. Perhaps from construction in general (because you see the problems), or architecture, commonly mechanical or other engineering disciplines, and there’s a handful of us physicists in there too. Construction Instruction: A consulting company and smartphone app with lots of videos, details, and instruction manuals on energy efficient and durable construction techniques. Green Building Advisor: A web resource for green building aimed at builders and technical minded homeowners. -Copyright 2018 Leigha Dickens, Green Building and Sustainability Manager, Building Science Manager at Deltec Homes. Also posted on Deltec Homes’ blog.